We all know that the Fourth of July is the time to get outside, relax with friends and family, and celebrate our Nation’s Independence. However, with everyone out celebrating, there is a higher risk of personal injury. It is important to follow precautionary measures to ensure a safe and fun day. 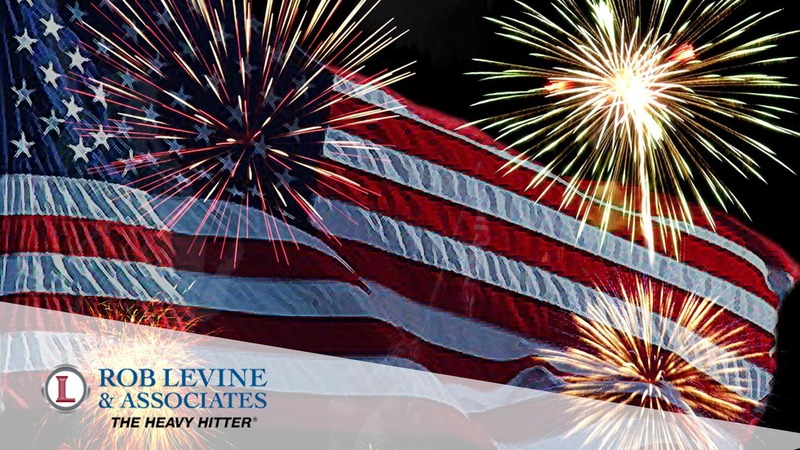 Therefore, Rob Levine & Associates has assembled four categories to keep an eye out for so that your fourth can be as safe and enjoyable as ever. Whether it be fireworks, bonfires, or grills it is very imperative that anything flammable is supervised by a responsible adult at all times. It is also important to be alert when supervising these activities and not be under the influence of drugs or alcohol. When using fireworks, make sure that the launch area is far enough away from people and objects to prevent injury or damages. Next, make sure to never leave your grill unattended and grill in a safe place (not indoors!). Finally, bonfires should be built in a safe location and should be at a controllable size. Once the event is over, the fire should be put out completely with water. With guests and children running in and out of the house ,dripping from the pool, there is a high potential floors will be wet and slippery. This creates an increased chance of slip and fall accidents. Make sure that all guests are well aware of the chance of the floor being wet, and dry the floor as soon as possible to prevent accidents. It is also very important that children are properly supervised in the pool and that all swimmers are practicing safe swimming techniques. All too often, people under the influence drive and crash, injuring and killing innocent civilians. The fourth, unfortunately, is notorious for drunk drivers on the road. It is imperative we keep the roads safe this holiday by using designated drivers or other taxi services. The fourth of July is also notorious for the traffic it brings; many travel all over the country to be with friends and families on this day. With traffic comes more of a chance for accidents on the road. Be aware of your surroundings, expect frequent stops, and avoid aggressive drivers. Finally, summer is known to be the season where most car break ins occur. Make sure to keep your cars locked in a safe area. This will help keep you and your belongings safe. Any animal should be supervised at all times or put away in a safe location. This prevents the chance of the animal biting, scratching, or injuring anyone. This will also ensure that your pets are staying away from the flames, water, and roads that can hurt them as well. These tips will help protect you and your loved ones from injury and make the day more fun and less stressful.